Two additional roles for the upcoming Harry Potter and the Half-Blood Prince have apparently been cast. The part of Regulus Black, death eater and younger brother of Sirius Black, will be portrayed by young actor Tom Moorcroft according to this page at Spotlight.com(be sure to click for additional photos of the actor). UK Castingcall pro also reveals that Charlie Bennison will be seen in the part of Sanguini the Vampire, who as readers will recall, is a guest at Slughorn’s dinner party. No formal announcement has yet been made on these latest possible additions, and we will update once we can receive confirmation from WB. 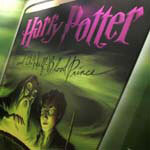 Harry Potter and the Half-Blood Prince will be released in theaters November 21, 2008.Thanks Snitchseeker!